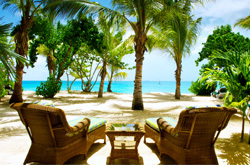 Galley Bay Resort & Spa, located just 15 minutes from Antigua’s V.C. Bird International Airport (ANU), defines Caribbean beachfront luxury. An intimate hideaway for discerning travelers who want a refined yet unpretentious experience, this all-inclusive, adults-only beachfront resort is situated on 40 acres of tropical paradise, surrounded by a bird sanctuary and a three-quarter mile-long stretch of beach on the sunset side of Antigua. A Green Globe Certified resort, Galley Bay offers a number of eco-friendly, on-property initiatives, including a reverse osmosis water purification plant, the use of recycled paper products and energy-efficient lighting throughout the resort. Read more. 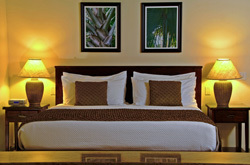 Galley Bay’s 98 guest rooms include Superior and Deluxe Beachfront rooms, Premium Beachfront Suites and Gauguin Cottages. A majority of the resort’s rooms are right on the beach. All guestrooms feature personally-controlled air conditioning, ceiling fans, satellite television, mini refrigerators that are fully stocked upon guests’ arrival, ample-sized closets, coffee makers, hair dryers, personal safes, radio alarm clocks, direct-dial telephones and oversized chaise lounges on terraces and balconies. Read more. Guests can stroll the three-quarter mile-long white sand beach, sail away on a Hobie Cat, take out a kayak, sunbathe by the resort’s pool with cascading waterfall, play a game of table tennis or enjoy a traditional game of tennis, croquet or horseshoes at no extra charge. Lagoon fishing, bicycle rentals and Internet access across the property are also complimentary for guests. Off-property excursions such as deep sea fishing & island tours can also be arranged with Guest Services for an additional fee. Read more. Galley Bay has three open-air, beachfront restaurants that offer Euro-Caribbean cuisine, featuring fresh, local produce and seafood. There is also a beachside Grille serving up casual fare throughout the day. 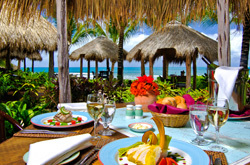 Ismay’s, the resort’s upscale fine dining restaurant, is perfect for celebrating special occasions. The resort’s award-winning Executive Chef Andrew “Stan” Baxter has won several gold medals and was trained at London’s Dorchester Hotel and Ritz Casino, among other fine restaurants. Read more. The Indulge Spa is surrounded by a tropical bird sanctuary and lagoon and features tree-top treatment pavilions, along with breezy seating areas and an outdoor plunge pool. The spa offers an extensive range of therapeutic & rejuvenating treatments using Pevonia Botanica skincare products. Treatments range from body wraps and facials to a romantic Swedish massage for two. Read more. The lush tropical setting, a stunning white sand beach lapped by the brilliant blue Caribbean Sea and an all-inclusive plan that provides for all the basics – including romantic dinners, snorkeling adventures and lovely accommodations – make Galley Bay a naturally romantic spot for your wedding, vow renewal, honeymoon or anniversary trip. Read more. If you require any booking assistance, including air-inclusive packages, please visit our website here or call 866-237-1644.